When The Biggest Earthquake Ever Recorded Hit Chile, It Rocked The World In 1960, all of Chile shook violently for more than 10 minutes. That quake along the western coast of South America was so big, it changed the way people see the world. Residents of Valdivia, Chile, look over wrecked buildings on May 31, 1960. The rumbling started on the afternoon of May 22, 1960. Sergio Barrientos, then about 8 years old, was walking down a street in his hometown in southern Chile when the ground started to shake. He remembers electrical wires swinging from the telephone poles — so violently that they slapped each other from opposite sides of the street. "At the same time, I saw some of the chimneys falling down through the roofs of the houses," says Barrientos. The ground shook so hard that he was knocked off his feet — unable to stand for about 10 minutes as the earth heaved. 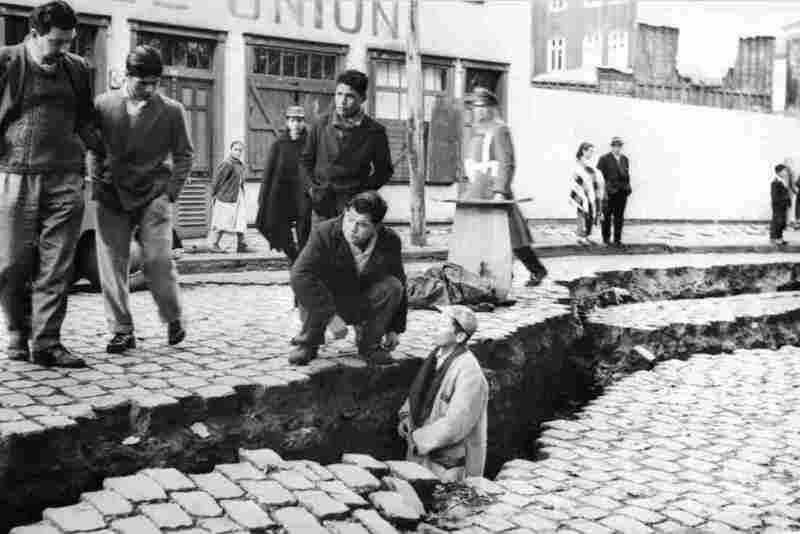 Residents of Valdivia, Chile, inspect an enormous crack caused by the Great Chilean Earthquake on May 22, 1960. Barrientos has since spent years studying earthquakes. He directs the National Seismological Center at the University of Chile in Santiago. The temblor he experienced in 1960 was the most powerful one ever recorded, with a magnitude of at least 9.5. "It was a huge, huge earthquake," he says. He now knows that during that quake, while he was stuck on the road, his hometown lurched about 30 feet west in a fraction of a minute. "The whole country stretched during this earthquake," explains Barrientos. "The coast moved toward the west. That increased the area of the country itself." The quake expanded the country of Chile by an area equal to about 1,500 football fields. It also caused a lot of destruction. Twelve hours after the shaking stopped, a tsunami smashed into Hawaii. Twelve hours later, another tsunami smashed into Japan. 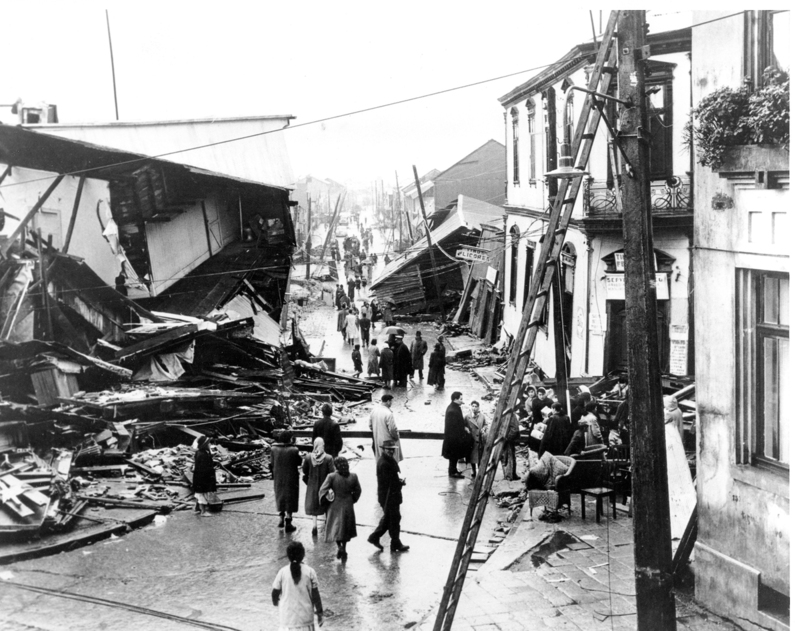 As a 1960 newsreel boomed, "Nations reckon up the grim toll of the seismic shocks that triggered a week of devastating earthquakes and volcanic eruptions in Chile, and tidal waves and tropical storms that battered every shore — from the Philippines and Japan to Alaska." What became known as the Great Chilean Earthquake revealed something new about the planet — that the world itself can vibrate like a guitar string. The seismic waves went through every part of the globe, even its core. And because they were so strong, scientific instruments from around the world picked up the signal. When it was over, seismologists realized the earthquake had given them a window into Earth's structure. Nature had given the planet something like an ultrasound scan. "That's very exciting because it's a new type of information that had not yet been available by all the studies from all the generations of seismologists before," says Larry Ruff, a seismologist at the University of Michigan. At the time, researchers were just starting to agree that the continents sat on top of giant plates, and that earthquakes were caused as those plates collided and folded into each other. They also were just realizing that big seismic waves, like the ones that Chile experienced, could actually lift the ocean floor, causing water to roll across the Pacific Ocean and crash into other shores many hours later. "It just caused an immediate flurry of activity," says Ruff, because scientists realized that if they had the right instruments to monitor those waves, they could warn people that a tsunami was headed their way. "As soon as that happened, of course, it just prompted this huge new effort to have even better, high-quality seismographs located all the way around the world," Ruff says. Today those instruments make up a global tsunami warning system. Unfortunately, that doesn't mean another major earthquake would be any less destructive. "We don't want to see an earthquake any larger than the 1960 earthquake, that's for sure," Ruff says. But it could happen. Scientists think that an earthquake as big as the Great Chilean Earthquake could occur on a number of faults — including one along the northwest coast of the U.S., the Cascadia subduction zone. And that one is overdue for some major seismic activity.